How unshakable is territorial integrity? There are parallels between the situation developing in Ukraine and what transpired in Bangladesh in 1971. In their approach to the situation in Ukraine, the Indian leadership has consistently underlined their commitment to the principle of a state’s territorial integrity. However, if India had always followed this principle, the independent state of Bangladesh would not exist on the world map today. As the events in Ukraine become more terrible and tragic, I get a feeling of déjà-vu more and more often. Judge for yourself. A country created artificially less than one hundred years ago by combining completely alien parts in historical, ethnic, cultural, economic and all other respects. A country in which the division of East and West can clearly be seen, not only is the population of these parts simply unable to get along with each other within a single state, but also feels an absolute rejection of principles which one part of the population is trying to impose on the other. When the Eastern population begins to demand respect for their legitimate rights and interests, the government, representing the interests of the West, unleashes a bloody massacre and genocide against its own people. In order to at least partly avoid the accusations of initiating a civil war, the country's leaders are arming militias among the number of fanatics who are not bound by any moral considerations and are ready to kill everyone – men, women, children and the elderly . Which country are we referring to? Ukraine in 2014? Yes, but not just Ukraine. Remember that the same thing happened over 40 years ago, much closer to the borders of India, which today, on the one hand, takes a rather balanced position in relation to Ukraine, but for some reason still cannot openly admit who is right and who is to blame for the current situation in this country. The duality of India's position can be partly understood. In fact, when the country has its own unresolved territorial disputes with its neighbours, unequivocal support of one of the parties to the conflict is fraught with certain political risks. But let's acknowledge that, for example, the Indo-Pakistani dispute over Kashmir has no parallels with the current situation around Ukraine. Yes, the Crimea was returned to Russia as a result of the nation-wide referendum, and some people have managed to point out the similarity of the Crimean problem with the one in Kashmir on this basis. However, there is a fundamental difference between these two situations: the referendum in the Crimea was held with the legitimate authorities being in full control of its territory, and nobody prevented the citizens from making their choice, and as it is known, the voting showed that 97 percent of the population were in favour of reunification with Russia. None of this is possible in today's Kashmir: there is no need to talk about a referendum in a territory controlled by at least three administrations. And, of course, one cannot expect such a clear voting outcome. This means that drawing parallels between the Crimea and Kashmir is simply inappropriate. Here’s another parallel with respect to what is happening today in the south-east of Ukraine, it is quite appropriate. It's about the 1971 events in Bangladesh (East Pakistan at the time), the same artificial union of East and West to please the political leaders’ political ambitions, the same struggle of the Eastern population for its vital national interests, the same attempt by the central government to crush protests by force and a desire to shift the dirty work on the illegal militias from the local radical fanatics. If during that time, nobody in the world had stood up for the rights East Pakistanis, the military actions that the Pakistani government led against the local population with the support of radicals, would have been crowned with success. This would mean even greater proportions of genocide, a complete infringement of the rights of the Bengali population, and a relegation of Bengalis living in East Pakistan to the level of second-class people who do not have any rights to their language, culture, or identity. In 1971, India had no doubt about how to act in this situation. 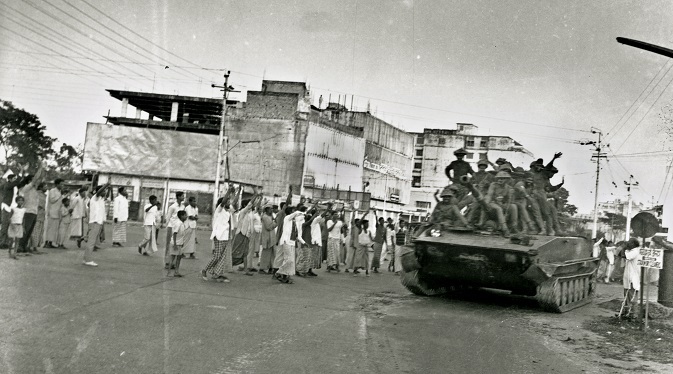 As soon as the Indian troops, who entered East Pakistan and saved hundreds of thousands, if not millions of lives, the national liberation struggle of the Bengalis was a success, and the independent state of Bangladesh appeared on the world map. Of course, today it is not so easy for India to take a similar position in relation to what is happening in Ukraine. Firstly, Ukraine is far away. Secondly, India itself is at a crossroads, and the country's leaders have to think more about their own political future in the country rather than about some actions in the international arena. Finally, over the decades that have passed since the events in Bangladesh, India's foreign policy has evolved towards the West. However, today, the West is an active supporter of pogroms in Kiev’s Maidan, it contributed to the rise to power of open Nazis in Ukraine, encouraging genocide of the Ukrainian people, perpetrated by illegitimate authorities of that country. Concepts such as “pogroms,” “Nazism” and “genocide” organically fit in with the liberal Western values. In these circumstances, there is hope that the current (or future) Indian leadership will still remember that the territorial value is not immune when it comes to people’ survival. There is still hope that following the example of India in 1971, Russia will not have to send troops to Ukraine to protect the civilian population. However, if the Nazis consolidated in Kiev continue to pursue a policy of genocide of their own people, Russia will have to take adequate measures. Then I would very much like to see India, while assessing the situation, recall Bangladesh rather than Kashmir. The writer is the head of the Asian Department at the Russian Institute for Strategic Studies.